Elizabeth Murphy believes the newly passed Grandview-Woodland Community Plan jeopardizes affordability by putting existing affordable rentals, heritage and character at risk in spite of community opposition. Photo courtesy Stephen Bohus, BLA. 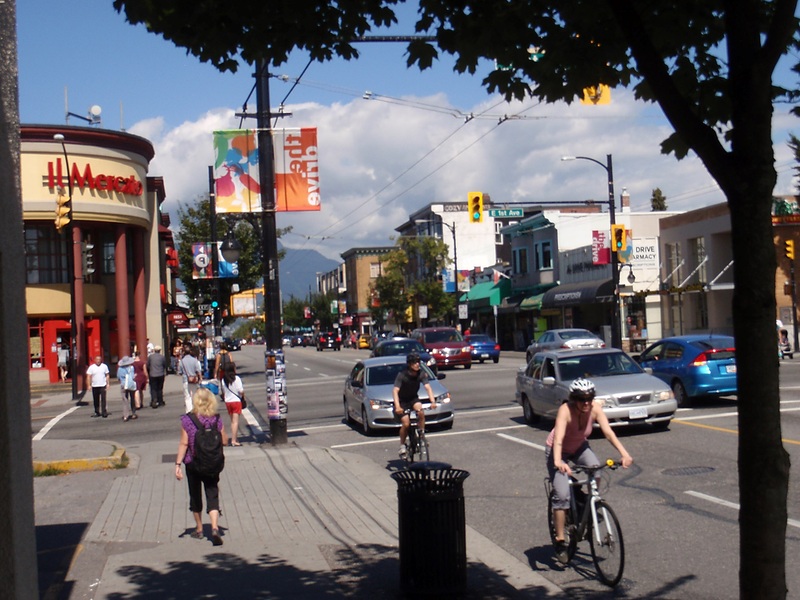 Vancouver just approved a new Grandview-Woodland Community Plan, in the neighbourhood known as the Commercial Drive area. The plan jeopardizes affordability by putting existing affordable rentals, heritage and character at risk in spite of community opposition. There are references in the plan to retaining existing rentals and protecting heritage, but the adopted policies do just the opposite. Incentives for redevelopment increase land speculation, leading to land, unit and rent inflation with loss of community character. At the start of the planning process, the planners opened their presentations stating that Grandview needed to increase density to meet projected growth under the Regional Growth Strategy (RGS) since 160,000 people were coming to Vancouver. This was later found not to be the case when the RGS was changed to reflect the 2011 census for a 148,000 population increase from 2011 to 2041. Further, the city’s consultant report from June 2014 confirmed, “The city has sufficient capacity in existing zoning and approved community plans to accommodate over 20 years of supply at the recent pace of residential development.” This is without including the Grandview Plan. The consultants used only part of the existing zoned multi-family capacity that was most likely to be developed. It did not include other zones such as duplex or single family that allows multiple suites and infill, or any further rezoning that was done since 2014, two years ago. This shows that there is no rush to create more city-wide zoning supply. Most of the Grandview neighbourhood was built out in 1910. From the 1940s after the war to the 1970s, many houses were converted into multiple-suites, rooming houses, rental apartments, co-ops and social housing, most of which still remain. This created more growth than most other areas of the city. The fact that the neighbourhood population has gone down by 6.5 per cent in the last few years is not a reason to upzone in a way that puts this existing affordable housing at risk. Vancouver’s practice up to 2007 was to avoid policies that would add development pressure into inner-city neighbourhoods with Local Area Plans, approved from the 1970s to 1990 in Grandview, Mount Pleasant, Strathcona, Kitsilano, Marpole and the West End. All are relatively dense and have the majority of the city’s affordable purpose-built rental housing as well as a large amount of the heritage character. Sam Sullivan’s EcoDensity in 2007 promoted increased density everywhere. 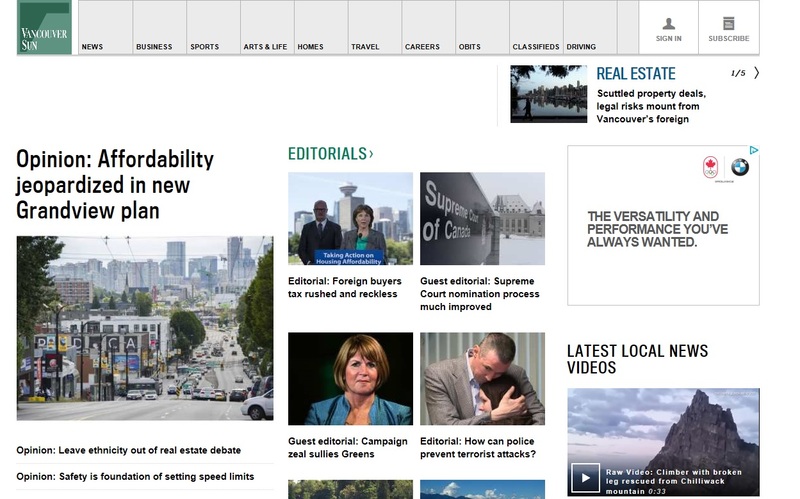 After Sullivan and his NPA council were removed from office in 2008, Gregor Robertson’s Vision council rebranded EcoDensity under Greenest City. Then these older more affordable neighbourhoods were targeted for increased redevelopment which was an unwise shift of policy. Grandview is the most recent victim of this direction. For example, in Nov. 2013 the West End Community Plan approved increased zoning in some areas up to 60 storeys. One of these sites was an assembly of two older, more-affordable low-rise rental apartment buildings, reportedly bought for $16.8 million in 2014. Recently sold to foreign investors for $60 million, they were flipped a month later for $68 million, all without paying property transfer taxes due to it being a bare trust. That plan allowing an increase to zoning to 60 storeys directly drove the land price increases. This should be a lesson for Grandview. 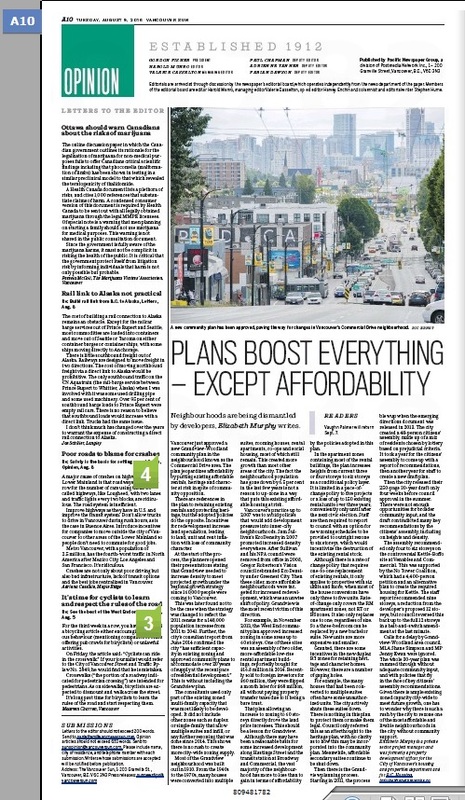 Although there may have been a reasonable basis for some increased development along Hastings Street and the transit station at Broadway and Commercial, the vast majority of the neighbourhood has more to lose than to gain in terms of affordability by the policies adopted in this plan. In the apartment zones containing most of the rental buildings, the plan increases heights from current three or four storeys to six storeys as a conditional policy layer. It is limited in a “pace of change” policy to five projects or a loss of up to 150 existing rental units over three years, conveniently only until after the next civic election. Staff are then required to report back to council with an option for new zoning schedules to be provided to outright rezone to six storeys, which would incentivize the destruction of the existing affordable rental stock. Although there is a rate of change policy that requires 1:1 replacement of existing rentals, it only applies to properties with six units and more, when most of the house conversions have only three to five units. Rate of change only covers the RM apartment zones, not RT or RS zones. It also only replaces 1:1 regardless of size. So a three bedroom can be replaced by a new bachelor suite. New units are much more expensive and smaller in size. Granted, there are some incentives in the new duplex RT zones for retaining heritage and character homes. However, there are a number of gaping holes that are not addressed in the plan. For example, the many houses that had been converted to multiple suites often have some of those units as unauthorized. The city actively shuts these suites down. There is nothing in this plan to protect them or make them legal. Council only referred this as an after-thought to the Heritage Action Plan, with no clarity as to how this may be incorporated into the community plan. Meanwhile, affordable secondary suites continue to be shut down. Then there is the Grandview planning process in general. Starting in 2011, the process blew up when the emerging directions document was released in 2013. The city created a 48 person Citizens’ Assembly made up of a mix of residents chosen by lottery based on prejudicial criteria. It took a year for the Citizens’ Assembly to come up with a report of recommendations, then another year for staff to create a new draft plan. Then the city released their 250 page 30 year draft only four weeks prior to council approval in the summer. Inadequate opportunity was provided for broader community input and the draft was in contradiction to many key recommendations by the Citizens’ Assembly including on heights and density. The Citizens’ Assembly recommended only four to six storeys on the controversial Kettle/Boffo site at Venables and Commercial. This was supported by the No Tower Coalition, who had a 4,400 person petition and an alternative plan to create the required housing for Kettle. The staff report recommended nine storeys, a reduction from the developer’s proposed 12 storeys, but council reversed this back up to the full 12 storeys in a bait-and-switch last minute amendment. Calls for a delay by Grandview-Woodland Area Council, MLA Shane Simpson, and MP Jenny Kwan were ignored. The whole 30-year plan was rammed through without adequate broad community input, and with policies that are contrary to key Citizens’ Assembly recommendations. Given there is ample existing zoned capacity city-wide to meet future growth, one has to wonder why there is such a rush by the city to rezone one of the most affordable livable neighbourhoods in the city without community support.